This weekend was my cousins hen party (bachelorette party) We were going to a spa hotel in Somerset and I was asked to bring along a cake for the guests to eat when they came out of their treatments. I decided to try something new (a bit risky when it's for an occasion!) and made a chocolate and salted caramel layer cake. I started by making two 8" chocolate sponges, beating 8oz caster sugar with 8oz butter until it was smooth and creamy and gradually added 4 beaten eggs and 4oz ground almonds and 4oz of sponge self raising flour. I put half in each 8" cake tin and baked at 190C for about 20 mins. I then made two 8" caramel sponges. I'd already decided I wanted to put some dulce de leche into the mixture but I'd never tried baking with it so decided to rely on good old google and found a recipe on the Pink Whisks' blog here http://www.thepinkwhisk.co.uk/2010/08/caramel-cake.html I followed it exactly apart from adding about 1/2 tsp of salt. I forgot to take a photo before the cake was cut but here's one of a slice so at least got one showing the different layers! Overall the experiment was a success and everyone was very complimentary. Next time I'd put more caramel between the layers. Isn't it always the case, forgetting to take a picture of a cake before you get stuck in. 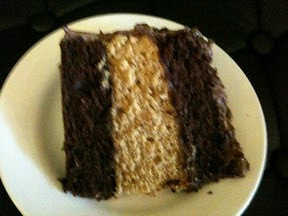 It's nice when you can see the layers of cake and it's suggested flavours, so inviting I think. I know I was so annoyed! I was hoping go get a good contrast between the colours. Might go for 4 thinner layers next time to get more of a stripe.